Photograph Melbourne from the highest viewing platform in the southern hemisphere 297 metres above the streets below. 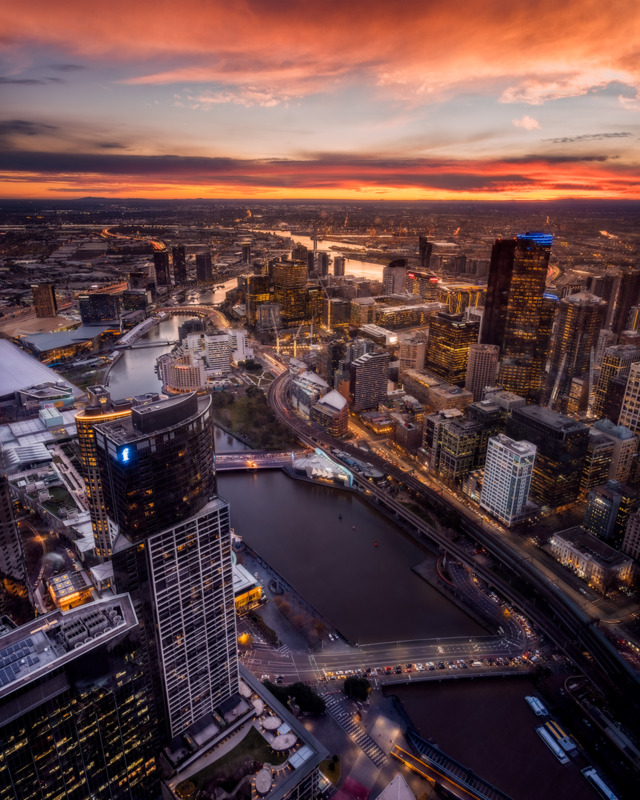 Shoot Melbourne from above and like you've never seen before. Receive one-on-one tuition from Adam on settings, composition, lens length, using filters at night and much much more. By the end of this workshop you will have more of any idea of how to shoot amazing photos at observation decks all around the world. Basic camera settings. Shutter speed, aperture and ISO and how they all work together. How to correctly expose an image at night using a tripod. How to best use composition to create a dynamic image. Using leading lines to create beautiful compositions. When to use different lens lengths. How to shoot and manage reflections in the viewing platform windows. 2.5hrs professional photography guidance from Adam. Camera, lenes, tripod, food, drinks and transport to Eureka Tower. On the day we will meet at (1hrs before sunset, check booking for times) at the main entrance of the Eureka Tower (Ground level). From there we will head up to the "Eureka Skydeck" as a group. Tour will finish up at approx. 1.5hrs after sunset. A DSLR/Mirrorless camera or similar and tripod is recommended for this workshop. So I can really focus on giving you the best possible photography experience I have limited the tour group size to 5-7 people. NOTE: All skill levels welcome. One of the keys to shooting clean and reflection free images through observation deck windows is to use a circular polariser filter. This is highly recommended for this workshop and I must say that this is a filter that never comes off my camera. Click the link to purchase a polariser before the workshop. If you have any questions at all please feel free to email. Filter sizes: 46mm, 49mm, 52mm, 55mm, 58mm,62mm, 67mm, 72mm, 77mm and 82mm. 2 hours photography workshop shooting Melbourne like you’ve never seen before.